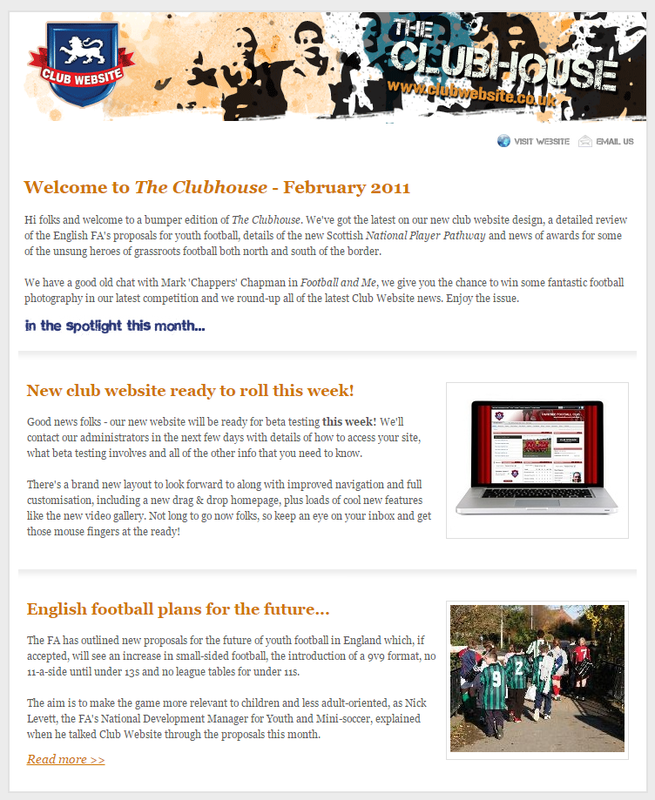 In June 2007, Club Website opened the doors of The Clubhouse for the first time as we brought you a brand new place to read about the beautiful game in our monthly newsletter. Since that very first edition, we've brought you the best grassroots football content: all the big news, interviews, competitions, offers and much more… straight to your inbox every month. The world of grassroots football was a different place back then. Kids played 11-a-side football on full size pitches from the age of 11, boys and girls any older than that couldn’t play in mixed teams, the Respect programme hadn’t even been invented yet and grassroots football facilities were chronically underfunded... OK, well perhaps not everything has changed! Clubs and teams across the country might still be crying out for better pitches and nicer changing rooms, but grassroots football's relationship with the world wide web has certainly changed and Club Website has been leading the way since those very early days. Our Clubhouse has always offered a warm welcome and, whilst we've undergone a couple of serious makeovers over the years, we've always tried to put great grassroots football content at its heart. We've been there with all the big grassroots football news stories, following the FA's National Game Strategy from its £200m launch in April 2008 (Issue 9) every step of the way to the latest £260m four-year investment this summer (Issue 95). We've tackled some hard-hitting issues, from looking at cardiac health in grassroots football after the deaths of a number of professional players in October 2007 (Issue 3), to the incidence of racism in grassroots football (Issue 40 & many others) and concerns over the rising cost of the grassroots game (Issue 83). We've been banging the drum about grassroots football facilities for over six years. It started with our Football Revolution in July 2009 (Issue 24) which prompted us to take a tour of some of the worst facilities out there (Issue 29), which ended up on Sky Sports News (Issue 34). Sadly, a lack of good facilities is still the number one issue facing grassroots football today (Issue 88 and beyond). As youth football has changed drastically over the last eight years, we've been there to cover it. Our February 2011 feature on the FA's plans to revolutionise youth football (Issue 43) was even used as a reference point by the FA before they had the information on their own website! 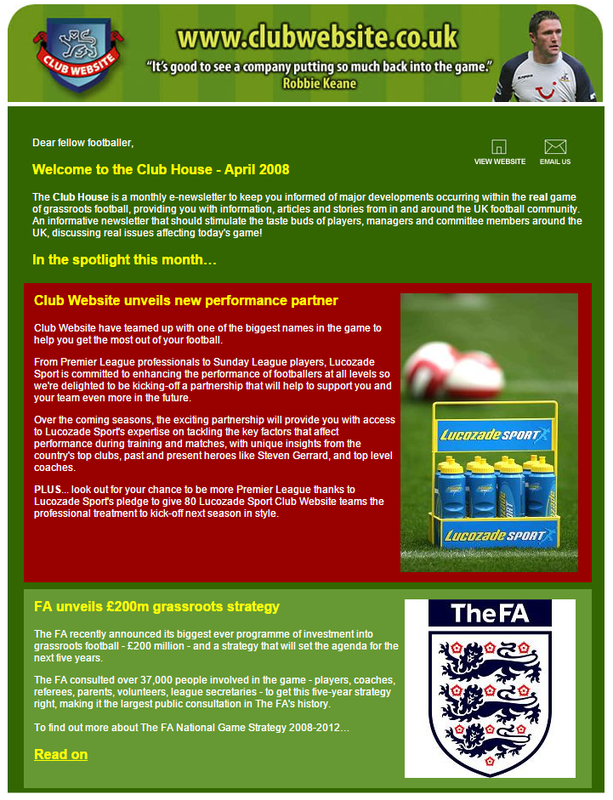 When the plans went through in May 2012, our report on what the changes involved (Issue 56) became such a go-to page for clubs and leagues across England, that it's still receiving regular comments today. It was a time of great progress in youth football, as we also featured the new youth development plans in Scotland (also Issue 43) and in Wales (Issue 44), whilst we've always tried to cover stories that matter right across the UK's grassroots community. We've helped to push women's and girls' football, since before the launch of the Women's Super League in April 2011 (Issue 45), all the way through to last summer's We Can Play campaign (Issue 93) and the boost the game received from last summer's Women's World Cup (Issue 94). The Clubhouse has reported on behaviour in grassroots football before the Respect programme was even heard of (Issue 4) and every step of the way from the FA scheme's launch in April 2008 (Issue 9) to asking if the campaign is still working, seven years on (Issue 96). We've tried to help raise the profile of the Save Grassroots Football campaign (Issue 76 and others) as they put pressure on the Premier League to spend some of their billions (Issue 89) on grassroots football, whilst we've been debating the pros and cons of a move to summer football with you since January 2011 (Issue 42) all the way to the present day (Issue 100). And that's just the grassroots news! Don't forget our interviews with everyone from FA chairmen to England goalkeepers - sometimes in one edition (Issue 14) - and all the players and managers we took Back to their Roots, including Rafa Benitez, Robbie Keane, Ian Rush, Peter Shilton, Ian Holloway and Faye White. Our Football and Me column gave us an insight into what the beautiful game means to some of football's famous faces (and voices) - including Ben Shephard, Mark Chapman, Jacqui Oatley, Clive Tyldesley and Jeff Stelling - whilst we had none other than World Cup referee Graham Poll answering your grassroots refereeing questions for two years from January 2009 (Issue 18). 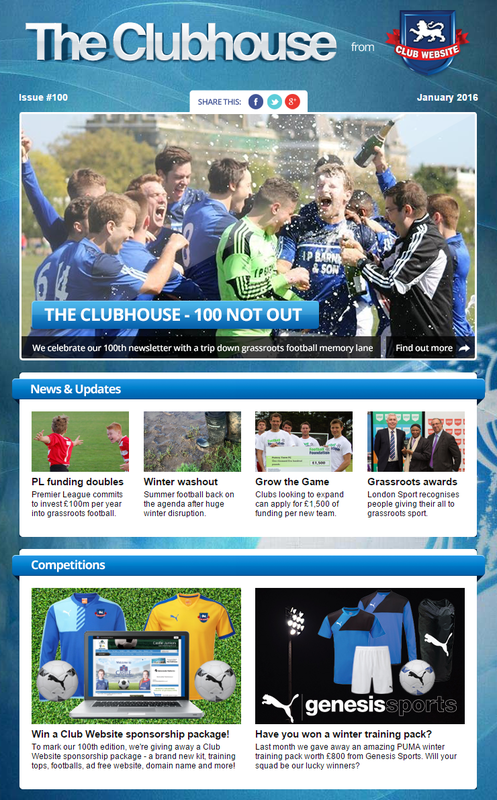 We've kept you up to date with all the latest updates from Club Website, from our first ever central 'community' site back in May 2008 (Issue 10) through all the upgrades to our club website (Issue 73) and league website service (Issue 77) all the way through to Club Website going mobile (Issue 86). The Clubhouse itself has been mobile-optimised since January 2014 (Issue 76), though we've still got a soft spot for Version 2.0 (Issue 24) and the slightly smaller Version 2.1 (Issue 53) and, of course, who can forget our beautiful green number from back in the day (Issue 1). Every step of the way, The Clubhouse has been the home to some terrific grassroots football competitions. We've given away prizes worth many thousands of pounds, plus once-in-a-lifetime, money-can't-buy experiences like the chance to play at Wembley (Issue 29) and Stamford Bridge (Issue 57). Now to celebrate our 100th edition of The Clubhouse, we're reprising our very first competition, as featured in Issue 2, by giving away a Club Website sponsorship package to one lucky team. Once again you can win a brand new kit, training tops and footballs but, new for 2016, the package also includes our ad-free website add-on, a bespoke website header image and your very own domain name, all free of charge. To be in with a chance of winning this fantastic prize for your football team, visit our competition page. Our Photo of the Month competition has been featured in The Clubhouse since January 2014 (Issue 86), showcasing the best of grassroots football and giving away a few prizes while we're at it. As well as cheering up plenty of winners with prizes, we've always tried to help all of our clubs generate much-needed revenue by providing great deals and offering fundraising tips (Issue 58) to help boost club coffers. We've got your back! We're always looking to improve our service, so if there's anything you'd like to see us do more of in The Clubhouse, or there's an issue or topic you'd like us to cover, please let us know in the comments field below or email us at clubnews@clubwebsite.co.uk. We always welcome feedback! 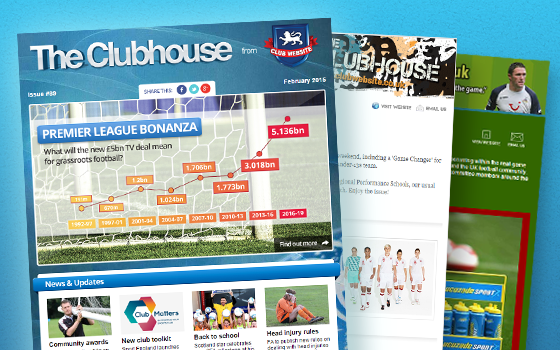 So finally, a great big thank you for joining us over 100 memorable editions of The Clubhouse. Without you there would be no Clubhouse - so thanks for coming. Now stay tuned for more of the weird - like Lanthorne Strokes drawing 10 games on the trot (Issue 51) - and the wonderful - like Huncoat United Under-15s winning their first game in 100 attempts (Issue 76) - of the beautiful game that is grassroots football.